If you've been following us since the beginning you'll know that we're always searching to create the ultimate performance template, we've used BOMES MIDI Translator, MaxforLive & even some custom Control Surface Scripts. All of these have got us closer to our dream but then the dreams changed and we start again. When i first used CLyphX Pro i quickly saw potential in using the Push2 as a DJ Controller, with it's Macrobat feature i could control the Bass across all eight tracks at once but the more i played with it the more i wanted even higher levels of control. So when Stray of nativeKONTROL sent me the first copy of Bindings my mind went into overdrive, the scribble pad was dusted off and i set about building a mapping that would satisfy my every desire of being as flexible as i needed it to be. 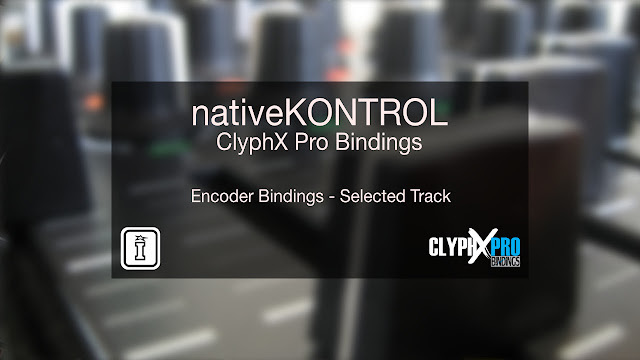 With Bindings i can map encoders, faders and buttons to continuous parameters in Live, i can name a rack and if it appears on the selected track i can automap to it, that rack doesn't need to be visible though, it could be buried within a chain! "Must have add-on for clyphx. This is the simplest and most flexible way to go about customizing your midi controller. One thing I set up is an automapped channel strip setup for my Midifighter twister. No 8 Macro limitation, No extra VST wrapper needed. by simply selecting a track I have instant access to the volume, pan, and sends. Additionally I have it set up so if there are certain VSTs on the chain it will Automap to those as well. I don’t even have to select the device, just the track. I've got this set up as well so in certain parts of my set knobs are mapped to the crucial elements for tweaking. I have different ClyphX X-Clips that switch the mapping per section! I’m not sure of any other midi controller/macro set up that can have this type of flexibility." Switch whats been mapped with the BIND Action, trigger a clip or scene, name a locator in Arrangement view or even switch the mappings by MIDI. Oh and did we mention the mappings are saved at a global level so they'll work across all of your Live sets!